Cathal Brennan looks at the Irish Free State’s answer to the Olympics – The Tailteann Games of 1924-1932. The advent of mass sporting events was one of the phenomena of the 20th century. For the first time, sport could be brought to a nationwide or international audience through the mass media. Sport could also be used to showcase a regime or a political ideology such as the Italian soccer team under Mussolini and the 1936 Olympics in Berlin under the Nazis. The Irish Free State, born out of a nationalist revolution in 1919-1923, had its own version; the Tailteann Games, which ran from 1924 to 1932. It was intended as a tourist attraction, as well as a demonstration of the new state’s independence and national identity. In practice, the Games highlighted many of the contradictions and divisions within Irish nationalism. The Games were presented as revival of an ancient Irish custom, crushed by the English invaders. According to the Aonach Tailteann promotional programme, the origins of the games could be traced back to 632 B.C. to King Luaghaidh Lamhfáda who ordered the celebration in honour of his foster mother’s funeral, Queen Tailté, ‘where athletes famed in Irish history met in friendly competition.’ The games began on the 1st of August, lasted for a week and were attended by kings, chieftains and nobles from across Ireland. Sport was an important aspect of Irish nationalism in the early 20th century. The Gaelic Athletic Association, (GAA) founded in 1884 promoted a separate Irish identity and tried to foster this, not only by promoting indigenous sports such as Hurling and Gaelic football, but also by banning ‘English’, or ‘Garrison Games’, such as soccer, rugby and cricket. The GAA provided many activists to the independence movement in 1919-1921 and on one occasion, on Bloody Sunday in 1920, one of their matches in Croke Park was attacked by British forces, who killed 13 civilians and one player. The idea of restaging the Tailteann Games was mooted by Michael Davitt in the 1880’s and the idea of reviving them were adopted enthusiastically by the cultural nationalist movement that blossomed towards the end of the 19th century. Many of these new literary, language and sporting bodies looked for their inspiration to a pre – Norman, Gaelic Ireland and the dress, games and mythology of that period was heavily used to promote these new groups and to inspire a confidence in the Irish people that they had a native culture that was ancient and distinguished. Sinn Féin embraced the idea of reviving the Aonach Tailteann and when the revolutionary republican parliament Dáil Éireann was established in 1919 the momentum for the games grew. Leading figures in the revolutionary movement, such as Éamon de Valera, proposed that they should be revived and the Dáil voted the necessary funds to meet the preliminary expenses. After the signing of the Anglo – Irish Treaty, and the formation of a Provisional Irish Government, planning for the games began in earnest. The Postmaster General, J.J. Walsh, was appointed as Director of the Games with W. Hanrahan appointed as General Secretary. Walsh had previously served as chairman of the Cork County Board of the GAA and a head office was secured at Emerald Chambers on Middle Abbey Street in Dublin. A meeting of the Provisional Government on the 27th of February 1922 agreed that as soon as the necessary powers were transferred to the government a grant of £10,000 would be made for the improvement of the GAA grounds at Croke Park in connection with the hosting of the Tailteann Games. The payment to the GAA began to cause controversy as J.J. Walsh and the GAA were under the impression that the money was a grant from the government, whereas the Department of Finance thought it a loan. Writing to William O’Brien in the Department of Finance in his capacity as Director of the Games, J.J. Walsh pointed out that the Aonach Tailteann was ‘purely governmental’ and any monies accruing from its production were the property of the government and were subject to audit by the Department of Finance. Walsh stated that the only condition attached to the GAA at the time the grant was applied for was that Croke Park would be available free for the duration of the games. However the outbreak of the Civil War in 1922 meant that the games were postponed until August of 1924, a year after the war had finished. At the time when the Games were held much of the capital had yet to be rebuilt after the fighting of the independence struggle and Civil War. The organisation of the Games was a tremendous undertaking and thirty two sub-committees were set up to co-ordinate the event. This was matched by the efforts of Irish groups across the diaspora who arranged the selection of athletes and the financing of their appearances at the Aonach themselves. The Free State had locked up over 12,000 republicans in the Civil War, many of whom were still in imprisoned in mid 1924. The Tailteann Games, supposed to be the exemplar of united Irish nation, could not escape the divisions caused by the internecine conflict of 1922-23. Since they were organised by the Pro-Treaty government, the Games would remain identified with the Free State side of the Civil War. Since they were organised by the Pro-Treaty government, the Games would remain identified with the Free State side of the Civil War. In reply to O’Higgins’ concerns, Walsh circulated a response to his cabinet colleagues. He accepted O’Higgins’ estimate of 100,000 visitors from the United States and stated that the Committee was looking into the use of ships in Dublin harbour to house some of the visitors. The fact that the Dublin Horse Show would also be running in August presented a further strain on places and postmen in Dublin would distribute forms around the county to see if private householders would consider taking in guests during the period. Walsh informed the cabinet that the principle work of seeking accommodation for the expected visitors to the Tailteann Games was being undertaken by Raymond Judd, the owner of Battersby’s, and H.M. Dockrell, another prominent Dublin business owner. Walsh optimistically wrote that, ‘during the period of the Games we anticipate little difficulty in grappling with the situation.’ Visitors arriving in Ireland would be greeted at Cobh by a tourist information bureau where they would be supplied with a programme for the Games and, ‘all pertaining thereto down to the most minute details.’ The trains to Dublin would contain notices telling the visitor to proceed to the Central Information Bureau in Dublin, which would be located in the GPO, and which was to be refitted and refurbished to this purpose. There the visitor could get information regarding accommodation in Dublin and throughout the country, details of banking and postal facilities and information regarding the Games. In a letter to Cosgrave from the Games Committee they stated that following a canvas of private houses, they had secured accommodation for 12,000 visitors and had secured all available accommodation in Trinity, Blackrock and Drumcondra colleges, along with the Dominican college on St. Stephen’s Green, the residence Hatch Street and Marlborough Hall. In his earlier letter Mulcahy had declared, ‘I feel the influence of the government should be used to stop the Games and I feel that the question of accommodation for visitors should be the grounds on which the government would intervene in this matter.’ Despite Mulcahy’s pessimism, the Games went ahead. The Aonach Tailteann took place between the 2nd and the 17th of August 1924. The list of sporting events was impressive; Athletics, Jumping, Weight Throwing, Decathlon, Swimming, Diving, Cycling, Rowing, Boxing, Rounders, Yachting and Motor Boat Racing, Golf, Tennis, Gymnastics, Wrestling, Weight Lifting, Motor Cycle and Car Racing, Billiards, Chess, Gaelic Football, Hurling, Handball and Camogie. The presence of so many different sports in the programme was only limited by the exclusion of sports subject to ‘The Ban’ by the GAA; soccer, rugby, cricket and hockey. The irony here was that ‘English’ sports, especially soccer, were also sometimes used as vehicles of Irish nationalist identity. Republican Todd Andrews recalled that soccer was the most popular sport for anti-Treaty internees in the Curragh camp after the Civil War. The O/C of the Anti – Treaty IRA in Dublin, Oscar Traynor, was a professional soccer player and had toured Europe as the goalkeeper of Belfast Celtic. He later became President of the Football Association of Ireland and served as a minister in numerous Fianna Fáil administrations. Rugby had an all-Ireland international team and was the sport of choice for upper-middle class Catholic schools, and of Republican leader Eamon de Valera, who disagreed with the Ban and urged the GAA to drop it in private correspondence. But sporting events only made up a portion of the Games. Competitive events were organised in Irish Dancing, Poetry, Prose, Drama, Oratory and Story Telling (All in Irish and English). Music competitions were held in the categories of brass and pipe bands, individual pipers and harpists and individual singers. There were also competitions organised in painting and arts and crafts categories. The opening ceremony of the Games took place in Croke Park before an estimated crowd of 20,000. The ceremony began with the entrance of Queen Tailté into the stadium along with her retinue of noblemen, depicted by young men dressed in the costumes of 11th century Gaelic warriors, carrying spears and accompanied by Irish wolfhounds. In the style of the modern Olympics, the Games’ competitors entered the stadium representing their home nations, Ireland, England, Scotland, Wales, the United States, Canada, Australia, New Zealand and South Africa. 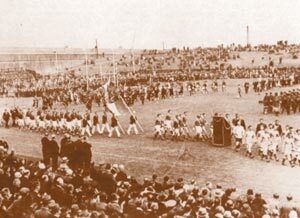 The Games were officially opened by the Free State President, William T. Cosgrave. Addressing the crowd, Walsh felt that the festival would have, ‘satisfied (foreign visitors) that the people of Ireland were capable of one common great effort to re–establish this old nation once again on its feet,’ and he also declared that, ‘this island of ours is not a colony but the home of a race of a historical lineage unsurpassed elsewhere.’ The opening ceremonies concluded with a choral music performance and an aerial display from the Irish Air Corps before the Irish hurling team took on the Scottish Shinty team in a compromise rules match. A banquet was held in the Metropole Hotel that night. Addressing the gathering, W.B. Yeates, chairman of the Aonach Tailteann Distinguished Visitors Committee, stated that, ‘out of a period of terror of strained hearts and tragic incident we are reverting to normality.’ Unfortunately the banquet was staged during a strike by municipal workers and there was no electricity in the building, the diners having to make do with candles. The Games benefitted from the fact that the 1924 Olympics had recently finished in Paris and, despite the fact that the intention behind the Games was that they were supposed to be open only to Irish competitors and members of the Irish diaspora, some of the top Olympic athletes were persuaded to attend the Tailteann Games after they had finished competing in Paris. This added to the prestige of the Games and drew in thousands of extra spectators eager to see some of the most famous names in sport such as Johnny Weismuller, who would later earn fame as star of the Tarzan films, competing in the swimming competitions in the pond at Dublin Zoo, H.M. Osborne, the famous American athlete and Olympic gold medallist, along with other household names such as Richmond Eve and Andrew Charleton. One of the most popular events was the motor racing competition in the Phoenix Park which drew thousands of competitors to view the spectacle. 50 bronze statuettes of Queen Tailté, designed by Professor Atkinson RHA, were presented to the winning athletes in major events. With over a thousand medals to give out, some magazines joked that competitors that showed up were virtually guaranteed a medal. The 1928 Games also benefitted from the fact that the Olympics that year were held in Amsterdam and again many international competitors were invited to attend the Aonach Tailteann after the Olympic Games had finished. Unfortunately some of the top athletes who were billed to appear failed to turn up. The motor sports events though proved once again to be a major draw for the Irish crowds. The 1932 Games were considered a disappointment. The fact that that year’s Olympic Games were to be held in Los Angeles meant that none of the top international athletes would appear, nor would the Irish Olympic competitors. The Games were completely overshadowed by the Eucharistic Congress held in Dublin earlier in the year which brought visitors from all over the world to Dublin, and over a million people to an open air mass in the Phoenix Park, and the Games duration was cut from a fortnight down to just a week. Journalists began to question the value of the Games and whether the international competitive element has given way to a parochial sporting event. The Games scheduled for 1936 were postponed and an inquiry by the civil service into the feasibility of holding the Games in the future was instituted by the government. The Tailteann Games had fallen victim to political divisions, both at a national level and within sporting bodies. These reflected various fissures within the new state; between those who accepted partition as a daily reality and those who held fast to the ideal of Irish unity; between those who insisted on an exclusively Gaelic identity and those who did not and between the winners and losers of the Civil War. In a report compiled by John Belton on the dispute in Irish Athletics, Belton outlined how the National Athletic and Cycling Association (NACA) had split. In 1935 the athletic branch of the NACA passed a resolution insisting on athletic control over all 32 Irish counties, including those in Northern Ireland, despite the ruling of the International Amateur Athletic Federation that the jurisdiction of members of the Federation was limited by the political boundaries of the country represented. This led to the suspension of the NACA from the IAAF in April 1935, meaning that members of the NACA were prevented from competing in international events. This led to a split in the organisation and two new bodies were formed, the Irish Amateur Athletics Union (IAAU) and the Cumann Roithaidheacta na hÉireann (CRÉ), who only claimed to represent the 26 counties of the Free State and were thus granted international recognition. This led to a bitter dispute between the NACA and the new bodies. Belton wrote that Walsh had taken a position fully supporting the NACA and that he had accused the two new bodies of, ‘attempting to stab the country in the back,’ at the NACA annual conference in February 1936. According to Belton this presented two major problems for the proposed Tailteann Games in 1939; Could a dispute between the Irish athletic organisations be resolved before the Games began; and if not would the Games be held under the auspices of the 32 county NACA? If the NACA were to organise the Games it was almost certain that Irish athletes from the two new organisations would be prevented from competing and international athletes risked suspension from their own athletics bodies. If the government were to subsidise the games in these circumstances it would lay them open to the charge of taking sides in the dispute. Belton also warned of the repercussions from the President and the Taoiseach attending a recent soccer match in Dalymount Park between Éire and Poland on the 13th November 1938. This caused such disquiet within the GAA that there was a real danger that the GAA would abstain from involvement in the Tailteann Games. This would cause major problems for the success of the Aonach as the football and hurling matches at previous Games had been the most successful in terms of gate receipts. The Report of the Inter – Departmental Committee on the feasibility of organising Aonach Tailteann in 1939 / 1940 was submitted to the government. The report outlined the costs incurred by the state in funding the previous three games. In 1922, the Provisional Government had forwarded £6,500 to the Games Committee, on top of the £10,000 grant to the GAA. On the 26th of November, a repayable grant of £7,500 at 5% interest was agreed by the government. £4,500 was paid to the Games Committee with the balance of £3,000 paid directly to the Revenue Commissioners in satisfaction of Entertainments Duty. The total receipts for the 1924, including the government grant of £4,500, amounted to £17,831. Total expenditure was £17,254, leaving the Committee with a surplus of £577 on the 31st March 1925. The total receipts for the 1928 Games amounted to £9,738 with expenditure coming to £8,002, leaving a balance of £1,736. In connection with the 1932 Games, the Dáil voted an advance of £1,000 to the Committee at 5% interest. 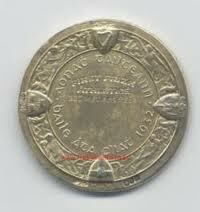 The total receipts for the 1932 Games were £6,930, with expenditure of £6,941, leaving a deficit of £11. The report recommended the discontinuation of the Games. On the 9th of June 1939 Walsh wrote to de Valera on behalf of the council of Aonach Tailteann. He outlined how gravely disappointed the Council were that after two years of waiting no decision had been made by the government on the future of the games. He wrote that, ‘it can scarcely be denied that the treatment of our request has been decidedly shabby.’ On the 4th of July 1939 the cabinet agreed to inform Walsh that the Tailteann Games could not successfully be revived. The Games had proved a useful way for Cumann na nGaedhael to portray the new nation as a confident, stable country with its own unique culture but enthusiasm for the Games was limited outside the ‘Irish – Ireland’ wing of the party which, as the administration wore on, became more and more marginalised within the regime. One of the worries expressed by Walsh was that without an event such as the Aonach Tailteann, to unite the diaspora throughout the world and to reinforce the sense of Irish culture, Irish ethnic groups would begin to be assimilated into their host countries and their attachment to Ireland would dwindle over time. 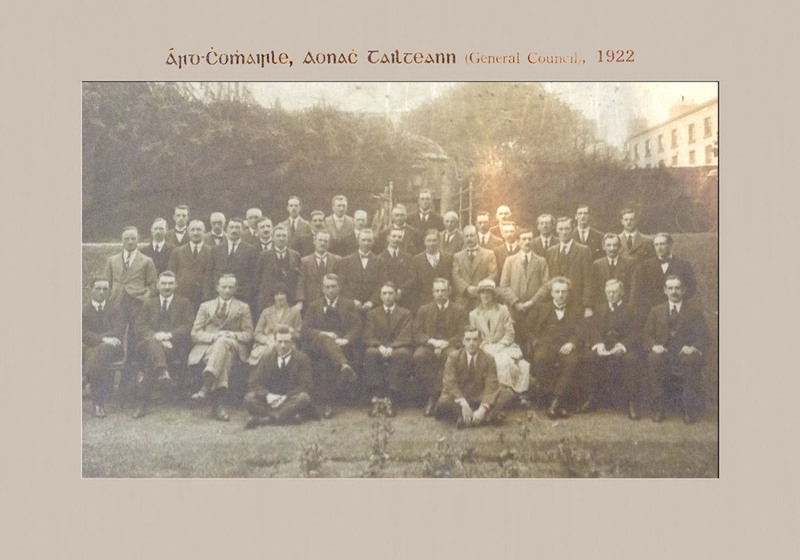 Ard Comhairle of the Aonach Tailteann 1922. (Picture kindly donated by Cathie Hynes). The fact that the Games were attempted in the first place was a testament to the vision and drive of the organisers and, after the difficult decade that had preceded the first Aonach Tailteann, any event that could capture the public imagination in the way the games did was to be commended. In many ways, the Games provide an illustration of the ideological divisions that belied the ideal of national unity in the early decades of Irish independence. Aonach Tailteann, Dir: Donnacha Ó Briain, TG4, 2007. Cronin, Mike, Projecting the Nation through Sport and Culture: Ireland, Aonach Tailteann and the Irish Free State, 1924-32, Journal of Contemporary History, Vol. 38, No.3 (July, 2003). Cronin, Mike, The State on Display: The 1924 Tailteann Art Competition, New Hibernia Review / Iris Éireannach Nua, Vol. 9, No. 3 (Autumn, 2005). Department of the Taoiseach, National Archive of Ireland, D/T S 1592. Department of the Taoiseach, National Archive of Ireland, D/T S 8369. Department of Finance, National Archives of Ireland, S 200 2 28. Department of Finance, National Archives of Ireland, S 200 3 32. Department of Finance, National Archives of Ireland, FIN 1 293. Department of Finance, National Archives of Ireland, FIN 1 379. Department of Finance, National Archives of Ireland, FIN 1 741. Meehan, Ciara, The Cosgrave Party, A History of Cumann na nGaedhael, 1923 – 1933 (Dublin, 2010). O’Callaghan, Margaret, Language, Nationality and Cultural Identity in the Irish Free State, 1922-7: The “Irish Statesman” and the “Catholic Bulletin” Reappraised, Irish Historical Studies, Vol. 24, No. 94 (Nov., 1984). Walsh, J.J., Recollections of a Rebel (Tralee, 1944). Aonach Tailteann, Promotional programme, 1922. NAI D/T S1592. Cronin, Mike, Projecting the nation through sport and culture, Journal of Contemporary History, Vol. 38, No.3 (July, 2003), p. 399. NAI FIN 1 / 741. J.J. Walsh to Wm O’Brien, 17th July 1922, NAI FIN 1 / 741. Meehan, Ciara, The Cosgrave Party (Dublin, 2010), p. 45. Walsh to Cosgrave, 27th June 1924, NAI D/T S 1592. Mulcahy to Cosgrave, 2nd March 1924, NAI D/T S 1592. Colgan to Mulcahy, 21st of February 1924, NAI D/T S 1592. O’Duffy to Cosgrave, 24th June 1924, NAI D/T S 1592. O’Higgins to Walsh, 24th January 1924, NAI D/T S 1592. Walsh to O’Higgins, 22nd January 1924, NAI D/T S 1592. Tailteann Games Committee to Cosgrave, 20th June 1924, NAI D/T S 1592. Programme of the 1924 Aonach Tailteann, NAI D/T S 1592. Cronin, Mike, Projecting the nation through sport and culture, Journal of Contemporary History, Vol. 38, No.3 (July, 2003), p. 404. Meehan, Ciara, The Cosgrave Party (Dublin, 2010), p. 46. Walsh, J.J., Recollections of a Rebel (Tralee, 1944), p. 81. Walsh, J.J., Recollections of a Rebel (Tralee, 1944), p. 80. Aonach Tailteann, Dir: Donacha Ó Briain, TG4, 2007. Cronin, Mike, Projecting the nation through sport and culture, Journal of Contemporary History, Vol. 38, No.3 (July, 2003), p. 408. Belton to Secretary, Dept. of Taoiseach, 8th December 1938, NAI D/T S 8369. Report of the Inter – Departmental Committee, NAI D/T S 8369. Cabinet Minutes 4th July 1939, NAI D/T S 8369. Walsh, J.J., Recollections of a Rebel (Tralee, 1944), p. 84. Cronin, Mike, Projecting the nation through sport and culture, Journal of Contemporary History, Vol. 38, No.3 (July, 2003), p. 410. Written by: Cathal Brennan on 23 February, 2011.on 17 June, 2014. 17 Responses to "The Tailteann Games, 1924-1936"
Thanks to John Dorney for his suggestions and help with the article. Another good article. I’ll be honest and admit I never heard of this event before. Not being a huge sporting fan that’s really no surprise form me, but I think I’d be right in speculating that not many would be overtly familiar with the event in general. I am aware from reading the article that the games where a backdrop to patriotic interests more than just ‘friendly games’. Those that are interested in their Irish political history would clearly have heard of it and I’m sure they would delight in reading what you have to say, as I did. I thought the best part (for me anyway) was when Johnny Weismuller (‘Me Tarzan, you Jane.’), according to your soucres competed in a swimming race in a pond in Dublin Zoo. I’d heard of the Tailteann Games, but had thought it was basically a World Cup of Gaelic football and Hurling. I’ve always wondered why it hasn’t been revived in these days of jet travel, where it’d be a lot easier and cheaper to get a team from the various diasporas back to the aoul sod than it would have been in the 20’s and 30’s. It could be set up in similar fashion to the way the Special Olympics was staged with towns and suburbs large and small hosting the participants. If it was staged during a year when there was no Olympic/World Cup on, it could be a bonanza. The Israelis do something similar with a sporting event for the Jewish diaspora – the Maccabiah games held every four years, the last of which in 2009 had 9,000 athletes from 54 nations participating in 31 sports – Team Israel provided a third of the competitors though. Very interesting article. It seems a great idea to revive the games, particularly considering the amount of surplus tourist accommodation that is available. The games could also include music, dance or traditional crafts in order to widen the participation. Some videos from the British Pathé website that show footage from the Tailteann Games. Title: “WORLD’S GREATEST ATHLETES AND RECORD-BREAKERS AT THE OLYMPIC GAMES arrive for Aonac Tailteann and are welcomed by the Director Mr. J. J. Walsh”. Title: “Aonac Tailteann Revival. Ireland’s Ancient Festival (Established 632 B.C.) revived after a lapse of Centuries. (Exclusive pictures)”. Various shots of a parade of athletes coming into a sports stadium, each team walks behind the flag of their nation – we see New Zealand and America. M/S of a team of motorcyclists pushing their bikes across the stadium. L/S of a large procession of athletes coming into the stadium grounds, passing packed spectator stadiums. M/S of a female hockey team, followed by a male hockey team, passing the camera. M/S of a row of official looking gentlemen of various nationalities sitting on a raised platform at the edge of the stadium – one wears a fez, another wears a turban. Where would I find photos of the games. Both my Mother and Father were in the games. My Mother lead the parade in with Irish Wolf hounds and my Father was a gymnast. My Father was also a gymnast in the Tailteann Games and we had one of the medals shown above with his name on the side, it was mislaid, but I often wonder if someone found it, they might return it to our family as a keepsake. The name printed on the side is James Toner. Writing about my great uncle, Daniel O’Rourke of Coalisland, Co Tyrone, I found a profile of him in the Gaelic Weekly, which refers to Ned Magee, Tyrone GAA, who scored a point from 70 yds at the Games in 1924. Are sporting records from the games kept? My Uncle Wp Salmon won the Palmer Cup for road racing 1930 . I have photo of same . I have several photos of the teams . His trainer was J Kernan . Are there any photos of Wp Salmon in other races of that time . He was in the Harp cycling club . If you have any other info in relation to him . I would love to hear from you . Many thanks . Gwen .